What the Spanish authorities trample over property rights in Spain, expats aren’t the only ones who suffer. Many ordinary Spaniards have had their homes, businesses and livelihoods cruelly snatched from them by developers in cahoots with politicians in the Valencian Region. There are thousands of expatriates, of all nationalities, currently suffering the consequences of urban corruption in Spain. Each of us, in our different localities, has our own particular predicament to contend with – ranging from illegally built housing to unjust expropriation, and often encompassing an unpalatable mixture of both. Thankfully, we can count on the support of those who, both individually and collectively, are prepared to help us fight our cause. The proliferation of associations now springing into life throughout the country is indicative of the extent of the problem of urban abuse: Abusos Urbanísticos, No (AUN); Abusos Urbanísticos Lliber, No! (AULN); Abusos Urbanísticos del Levante Almeriense, No! (AULAN); Catral Asociación Contra Abusos Urbanísticos (CACAU); Justice for Catral Residents (J4CR), …and the list goes on. 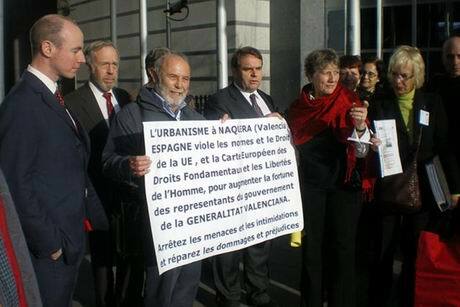 Whilst representing moving and inspiring examples of solidarity, sadly, these platforms are also indicative of the refusal of the Spanish Authorities to show any willingness to provide very necessary solutions to the problems of urban abuse, let alone accept any part in their creation. How can it be, when Spain ranks as the second country in the world with respect to the number of laws in force, that the nation has earned itself the reputation as one which is corrupt? Enrique Climent, President of AUN, explains that ‘the most important corruption is that which is not even classed as a crime.’ He refers to those offences that are actually allowed to prosper as a result of the structure and wording of particular laws. Like Climent, there are many further examples of Spanish citizens valiant enough to swim against the tidal wave of corruption that sweeps the nation. Prominent figures include Willie Meyer, Raul Romeva, Carlos Carnero, José Sanmartín and, of course, the more immediately recognisable campaigner, Marta Andreasen. Many more manifest their support as members of collectives such as The Federación de Asociaciones en Defensa de los Derechos Humanos y en Contra de los Atropellos Urbanísticos y Medioambientales (FAUN), the association Plataforma Defensa De La Huerta, and the recently created organisation Transparencia Urbanística. Corruption knows no national boundaries and neither does its effects. This is certainly the case in Spain. Whilst many of the urban scandals affect expatriates in search of peaceful retirement in the sun, we should also spare a thought for those Spanish nationals, our newly adopted neighbours, whose homes, businesses and livelihoods have been snatched cruelly from them, literally overnight in some cases, by urban speculators driven by heartless greed and backed by an unjust law. Let us consider the case of one man: 60 year old Enrique Lluch, from Valencia. Enrique was the owner of a small but prospering garden centre in the town of Náquera. In difficult and uncertain times, Enrique had to work hard to build a future for his family – a future that was destroyed the day the developers moved in. They had more money, more influence, more power …and consequently more right to do whatever they saw fit to do. And what they saw fit to do, in this instance, was erect enormous industrial blocks (in contravention of urban law) that would eventually engulf Enrique’s small plot and his life’s work. Of course, he put up a fight, but the ageing market gardener was no match for the construction Goliaths who had simply decided that he was in the way, and surplus to requirements. With desperate, heartbreaking impotence, Enrique watched as his livelihood literally withered and died around him. Those who had almost everything now wanted all that Enrique had, too, so they got it. But the story does not end there. Apart from surrendering his only means of supporting his family, Enrique was ordered to pay approximately 150,000 euros towards the urbanisation costs for the area. That day, Enrique Lluch watched in desperate impotence as his life’s work was taken from him. His days as a market gardener ended and his days of campaigner for justice began. Shoulder to shoulder with the likes of Charles Svoboda, Michael Cashman, Roger Helmer, Margerete Auken, Neil Parish and David Lowe, Secretary of the Petitions Committee of the European Parliament, Enrique Lluch began his struggle to have his, and similar cases, heard. Twelve years later, Enrique and his family have still seen not a penny in compensation – not that any amount of money could make amends for the physical, psychological and emotional trauma that this event has caused in their lives. Enrique has now spent twelve long and bitter years in his struggle to be heard, his struggle for justice. I would like to tell him that he is not alone. Whilst there are no national boundaries to corruption and its effects, I would like to show Enrique that neither do such boundaries exist to compassion and solidarity. I would like to tell Enrique that his fight is our fight and that we, too, will do all we can to keep such issues at the forefront of European politics. We can start by writing to our MEPs and by giving voice to this injustice wherever the opportunity presents itself. We can pledge our support to those who campaign for the application of economic sanctions should Spain continue to refuse to comply with European law. This is the only hope that those like Enrique have of obtaining some kind of compensation for the injustice and inhumanity they have had (and continue to have) to endure. Copyright Linda Palfreeman, reproduced with permission.